It’s the season for setting new goals and making healthful lifestyle changes. Every new year excites that inner goal-setter inside all of us with a passion for researching and planning how to become a brand new person. If you have just come off of your holiday detox, then you may be trying to decide what new healthful diet is right for you. None of us should be surprised that one of the most popular resolutions every year is to lose weight and eat healthier. Keep in mind that every person’s dietary needs will be different and there is no magic solution to successful weight loss and guaranteed health. Everyone will have different struggles and different successes. Morning shows, daytime television, books, and the internet continue to boast all the time about the new “it” diet. Maybe you are trying to slim down, find the fountain of youth or you are trying to heal from a disease? In any case, you are likely to come across a multitude of dietary guidelines. Today, I’m sharing some of the most popular healing diets to help you get down to business and I’ll decipher which one may be right for you. Each low carb diet has varying restrictions on the type and amount of carbohydrates allowed. 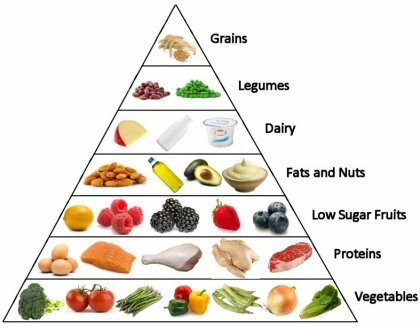 Typically, low carb diets eliminate grains, starchy vegetables, most fruit, legumes and certain dairy. Most commonly used for weight loss, some diseases can be managed. During digestion sugars and starches are broken down and absorbed by the blood stream where they trigger an insulin reaction. By decreasing carbs, insulin levels are lowered and the body will burn stored fat for energy. The biggest benefit of a low carb diet is insulin management. In excessive amounts, insulin can increase oxidative stress and accelerate aging. Increased insulin levels are also linked to high blood pressure, high cholesterol, and type 2 diabetes. Some low carb diets can restrict too many carbs and force the body to go into ketosis. This can have negative side effects and can even be dangerous for some individuals. Since low carb diets cut out most fruits and some vegetables, there is a concern that a nutrient deficiency may develop. It is also easy to become constipated since fiber intake is limited. This diet consists of eating mostly meat, eggs, cheese, milk and butter, greens and small amounts of other veggies. You may experience rapid weight loss but it is also easy to hit a plateau. This diet limits the carbohydrates that are considered to be inflammatory foods; such as grains, starches, sugar, and most dairy. The SCD can help regulate blood sugar and decreases the risk of some diseases. Inflammation in the gut is one of the root causes of what is plaguing our bodies today. By eliminating inflammatory foods, diseases like arthritis, fibromyalgia, celiac, and irritable bowel diseases can be managed. Greatly improves digestion. It’s common to feel less bloated and less fatigued since inflammatory foods are replaced with easily digestible foods. Because the diet eliminates many sugars and starches it is likely to see weight loss. As with the low carb diet, the SCD will require extra planning and prep work. Still allowing dairy may cause issues for some people. This diet is often used to relieve symptoms of inflammatory diseases. Favorable foods include yogurt, legumes, and most fruit and vegetables. Allowing fruits and vegetables means eating more fiber and vitamins. Standing for Gut and Psychology Syndrome, this diet aims at healing the gut. Foods to avoid include processed foods, all grain, processed and added sugar, starchy vegetables, artificial chemicals, preservatives, and all dairy. A wide variety of health problems can be traced to an imbalance of gut microbes. When gut flora is out of balance, food is not digested and absorbed properly. The undigested food is converted into toxins that can obstruct how the brain and body behave. It is recommended to avoid outside toxins as well to maintain optimal gut function and balance. A healthy gut is a major factor for the human body to run like a well-oiled machine. This diet focuses not only on eliminating inflammatory foods but takes it a step further to heal and create a healthy gut. This diet may feel like a big change at first especially when eating the SAD diet for so long. Additional planning and prepping accompany this diet, as with all lifestyle changes. Most commonly used to treat bowel and gut diseases, autism, ADHD, depression, anxiety and autoimmune disease. Essentially, this diet consists of organic, real, unprocessed, whole foods. No artificial (toxic) ingredients or preservatives, no grains of any kind (wheat, rice, corn, etc.) and no sugar or dairy. Based on foods that were available during the Paleolithic Era, the Paleo Diet recommends cutting out all grains, all dairy, all legumes, anything artificial and all processed sugar. Foods like meat, fish, eggs, tree nuts, roots, vegetables, and fruits should be eaten instead. Before the Neolithic Era and the practice of agriculture and farming, our ancestors were hunter-gatherers and primarily lived off of foraged foods. These would have included foods that were nutrient dense and easy to find and eat. Traditionally as nomads, a verity of foods would have been accessible, especially leafy greens. Many of the diet’s benefits include eating more plant-based foods and less artificial “junk” foods, eating foods that reduce inflation, increased nutrients, and weight loss. It is easy to overeat protein and forget to eat enough plant based food. You can eventually become seriously deficient in Vitamin B6 with extended time without grains. This diet is one of my favorites because it focuses on eating a diet that closely resembles our pre-agricultural ancestors. Eliminating inflammatory foods such as grains and dairy, and eating more plant-based foods is a great diet to heal the body. The paleo diet is commonly recommended for those suffering from autoimmune diseases. With the same principles as the Paleo diet, this diet has a specific concentration on nutrient density and stricter guidelines for foods to avoid such as nuts, seeds, eggs, and nightshades. The big difference here is a focus on health-promoting foods; only the clear winners are chosen. Organ meat, seafood, and vegetables make the cut for the top foods to eat while on the Autoimmune Protocol Diet. These foods are denser in healing nutrients that the body needs. Taking it a step further, foods that are thought to have compounds that stimulate the immune system or harm the gut are eliminated. The purpose of this diet is to flood the body with nutrients while also doing away with foods that can hinder healing. It is likely to get a wide verity of foods and nutrients from this diet. This one can be tricky to navigate since remembering that all seemingly healthful foods are not favored. For instance, tomatoes, peppers, eggs, nuts, and seeds are off the table due to their compounds. As well as potatoes and anything too starchy. The Autoimmune Protocol addresses areas known to be important contributors to autoimmune diseases like regulating hormones and repairing the gut. Nutrients that support your health become the focus and as a result, the body can heal itself. A hybrid of the paleo and vegan diet, The Pegan diet focuses primarily on fruits and vegetables. The idea is that 75 percent of your diet should be fruits and vegetables, and the other 25 percent made up of animal protein and high-quality fats. This diet is most like the Mediterranean diet we have been hearing so much about this year. By focusing on low glycemic foods we can increase the body’s sensitivity to insulin and improves diabetes control, reduce the risk of heart disease, and we can drop a few pound in the process. This diet is easily followed by the average person. Some problems with the Paleo and vegan diet such as missing some grains or lack of protein are removed from the equation. There are very few cons to this diet. The main downside is that it may take a little getting used to as it requires cutting out dairy, gluten, soy, and refined sugars. By combining the best of two diets, this way of eating makes the most sense for our health. The goal is to focus on biology and how food affects humans. The benefits of a diet with ample amounts of plant-based foods, an emphasis on grass-fed organic meats, and encouraging high-quality fats make this nutritional philosophy one that resonates with me. In fact, my family adheres to the same principles of the Pegan diet. To see some of our meals, check out this post. Also, you can follow me on Instagram. Most people today easily grasp that a vegetarian diet means not eating meat. The tricky part is that there is no single eating pattern for each person following this type of diet. Vegans eat only plant-based foods and no animal products at all. Vegetarians range from total vegetarians to lactovegetarian (includes eggs and dairy) and semi-vegetarians who include dairy, fish and even sometimes chicken. Well managed plant-based diets can be rich in the verity of nutrients that many of us are lacking. Eating mostly plants offers a diet that is low in saturated fat, high in fiber and chocked full of direct antioxidants to deliver beneficial nutrition. The biggest advantage for a vegan or vegetarian diet is eating a bounty of fruits and vegetables. Eating more plant-based foods can help fight obesity, diabetes, heart disease, and prevent cancer. It is also considered to be a sustainable diet since the production of animal products places a heavy burden on our planet. May be less expensive if you are mostly eating produce. While it is likely to pack in a bunch of nutrients from all the plant foods you will be eating, there is also a risk of becoming deficient in key nutrients; some of which are only found in animal products. Keeping an eye on carbohydrate intake is recommended, since foods like potato chips, French fries and pasta are all considered vegetarian. It is possible to eat too much corn, wheat, and soy; these foods can cause inflammation. With almost all diets that eliminate a whole food group, there is a risk of vitamin deficiency. Testing for your specific nutritional needs will give a better insight as to where you should supplement your diet. My opinion- and many health care professionals agree, that foods should always be organic, unprocessed, GMO-free, and contain no artificial ingredients. Why is that? Eating organic foods will help reduce the body’s overall toxic burden. With so many outside toxins that may be unavoidable, it’s important that our diets do not add to our exposure. USDA Certified 100% Organic foods are non-GMO by definition. Among many unfavorable side effects of GMO foods, crops can be combined with Bt-toxin. Although the intention is to kill off insects, the poison is not specific and can eat away at the lining of the human digestive tract. One study found evidence that organic crops yield more densely nutritious foods. Other studies suggest that organic foods are higher in flavonoids; a cancer-fighting compound. Artificial ingredients: This includes artificial sweeteners, preservatives, colors, and flavors. Not only are these ingredients mostly found in processed “junk” foods, but these chemicals are highly reactive, may interact with DNA and increase cell mutation. Not to mention that many artificial additives are made from petroleum. Yuck! No thank you. Whether you choose team Paleo or go full-on vegan, remember that our pre-agricultural ancestors survived on a wide range of diets depending on their region. The main objective is to find a diet that is catered to your specific needs based on lifestyle, health conditions, and nutrition.